There are quite a few different species of beetles but most common are the sawtoothed grain beetle, the flour beetle, the drugstore beetle and the cigarette beetle with the flour beetle being the most common beetle. These beetles are most easily taken care of by getting rid of the infested material. Pesticide use is limited considering that food is being dealt with. Freezing, heating or disposal of the infested food can eliminate the pest. 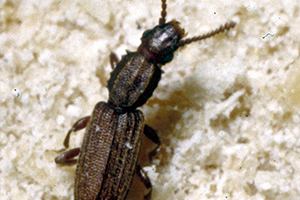 The borers are a type of beetle. 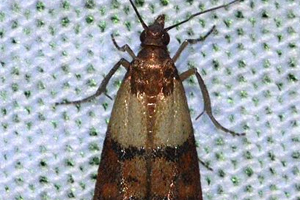 The lesser grain borer is a “primary pest,” which alludes to the damage they cause to stored whole grains and other foods (secondary pests go after the damaged grain the primary pests fed on). 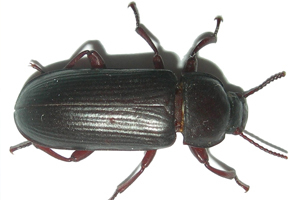 Lesser grain borer beetles are dark brown or black with small pits on the wing covers. The borer will reduce grain to a mere shell. The most common infestation is of whole seeds such as corn or wheat. Control includes elimination of the infested source, freezing or cooking the food or, if the case is extreme, fumigation may be used. The borer when dead has an odor, which leaves food that was infested to be contaminated. The dark mealworm has a dull pitchy black color whereas the yellow mealworm is a shiny polished black or dark brown color. The mealworm is the largest-sized insect that infests stored products. The female lays the eggs, which are bean shaped and white. The eggs are coated with a sticky secretion, which causes flour and other food particles to be collected to the egg. 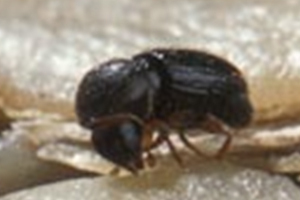 Ways of treating for this insect is by heat and cold methods and by pesticide treatment of wood floors, walls and cracks. There are many different species of mites. They are subdivided under food-inhabiting mites, parasitic mites of birds, rodents and man and plant feeding mites. The food-inhabiting mites can live off tiny fragments of organic material. 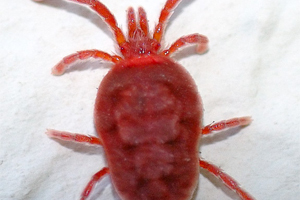 Poor sanitation, high temperature and humidity are common contributions to an outbreak of mites. Vacuum, sanitize and stabilize the environment for initial control of the mites. Limited pesticide treatment can be used with restricted effectiveness due to food sources being infested. Eggs of the moth are laid wherever the food for the larva occurs and are usually fastened to the food source. Infestation can be controlled by pesticide application, discarding the infested product and cleaning out the food storage area. The moths will feed upon grains, dried fruits, birdseed and old dog food. Some moths leave an odor and contaminate infested grains. The weevil will lay eggs in a kernel of grain. It will make an opening, lay the egg and then reseal the hole leaving the egg to hatch and feed upon the inside of the grain. 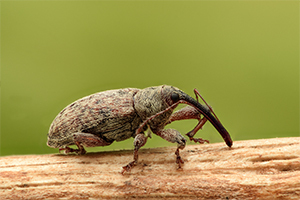 The weevil is usually confined to stored grain and transported by man. Food sources include corn, wheat, beans, nuts and cereals. Ways of control are by destroying the infested food source or by means of heat and cold.